Every print job must be charged or assigned to an account. This can be a personal or shared accountA shared account is an account that is shared by multiple users. For example, in business, shared accounts can be used to track printing costs by business unit, project, or client. Organizations like legal firms, engineering firms, or accounting offices often have long lists of accounts, projects, clients, or matters. In a school or university, shared accounts can be used to track printing by departments, classes, or subjects.. The account can be either automatically assigned, or selected by a user at the MFD or via the User Client. If required, you can make both of these options available to your users as each method is suitable for different printing scenarios, for example, printing from a computer versus printing from a mobile device. To enable your users to do this, you must configure them with the relevant Account Selection options. For more information, see Account selection configuration. For PaperCut MF, the simplest method for account selection is for users to assign an account directly at the MFD. It doesn’t matter if users are printing in the Mobility Print environment from a mobile device (such as a smart phone or a tablet) or from a computer; the experience is streamlined. It also eliminates the need for an additional tool like the User ClientThe User Client tool is an add-on that resides on a user's desktop. It allows users to view their current account balance via a popup window, provides users with the opportunity to confirm what they are about to print, allows users to select shared accounts via a popup, if administrators have granted access to this feature, and displays system messages, such as the "low credit" warning message or print policy popups.. All users, including Mobility Print users can select or change the account at the MFD. For more information, see Assigning accounts to print jobs at the MFD. MFDs that do not support assigning accounts at the MFD (see System requirements). users who have permission to release jobs printed by other users, or charge a job to another user (for example, delegated print release). users who need to do more than just assigning accounts, for example, cost adjustments (available only in the User Client). overrides and print scripts that affect account selection, such as the printJobAfterAccountSelectionHook, Print Scripting with Mobility Print, etc (available only in the User Client). For more information, see the User Client. While the User Client is ideal for printing from a computer when these advanced account selection features are needed, it cannot be used when printing via Mobility Print. This is because it cannot be installed on mobile devices. All printing is automatically charged to the user's personal account, without any user interaction. All printing is automatically charged to the user's personal account, with minimal user interaction. All printing is automatically charged to a selected account, without any user interaction. Printing is charged to an account selected by the user, and is suitable to environments with few shared accounts. This requires user interaction. Printing is charged to an account selected by the user, and is suitable to environments with many shared accounts that are used frequently. This requires user interaction. This is designed for authorized users in the role of "print managers" who perform printing on behalf of other users, providing them with several options, such as being able to charge printing to any user or account, apply adjustments to the job costs (e.g. for charge for special paper, binding, etc). This is suitable to print rooms where staff print on behalf of other users and email them to the users; these print jobs often involve complex instructions such as binding, color paper covers, etc. This requires user interaction. This does not require account selection by the user. All printing is automatically charged to the user's personal account, without any user interaction. This mode is useful when a user only ever charges printing to a single personal account and does not require all the other Account Selection options that require additional user interaction. In the Account Selection area, in Print account selection, select Automatically charge to personal account. The Bulk user actions action is a convenient way to apply this change to many users. The Group List page is displayed. In the Change settings area, select the Change account selection setting check box; then select Automatically charge to personal account. The Group Details page is displayed. In the New user setting area, select the Use this group to define new user settings check box. In Initial Account Selection Settings, select Automatically charge to personal account. This requires the User Client. Users will not see their print job at the MFD unless they have confirmed the job via the User Client. All printing is automatically charged to the user's personal account. But requires users to confirm this action, ONLY via the User Client (even if the ability to assign accounts at the printing device is available). This mode is useful when a user only ever charges printing to a single personal account and does not require all the other Account Selection options that require additional user interaction. In the Account Selection area, in Print account selection, select Charge to personal account with confirmation. In the Change settings area, select the Change account selection setting check box; then select Charge to personal account with confirmation. In Initial Account Selection Settings, select Charge to personal account with confirmation. All printing is automatically charged to a selected account, without any user interaction. This mode is useful when a user only ever charges printing to a single account and does not require all the other Account Selection options that require additional user interaction. An example of where this would be useful is in a school or business environment where shared accounts represent a department within the organization. initial user settings on the Group List page. Once the Automatically charge to a single shared account option is selected, then enter the account name to charge. To select a sub-account the account name must be entered in the parent\sub-account format. In the Account Selection area, in Print account selection, select Automatically charge to a single shared account. Charge to account—enter the name of the shared account to which costs will be charged by default. When shared account is selected—select whether you want to charge costs to the shared account or the user's personal account. In the Change settings area, select the Change account selection setting check box; then select Automatically charge to a single shared account. In Initial Account Selection Settings, select Automatically charge to a single shared account. Printing is charged to an account selected by the user, and is suitable to environments with few shared accounts. If the only option configured is to Charge to their personal account, then the User Client is required. For more information see User Client and Changing print job settings at the MFD. Select shared accounts from a list—When a shared account is selected by a user, the Default shared account option allows you to specify a default shared account, which is pre-selected for the user, further accelerating the process of selecting a frequently used account. The User Client is required for this option. For more information about the Print as another user option, see Account selection in non-domain environments (workgroups). the user's personal account, but in reports the job is allocated to the selected shared account. This allows printing to be tracked against shared accounts while allowing the use of user-based quotas. The cost of the print job is deducted from the user's personal account, but the job is allocated against the shared account, which allows for account based print reporting. Changes made to any of these options for any user, take effect immediately and do not require the User Client to be restarted. This requires the User Client, if the ability to assign accounts at the printing device is unavailable. For more information see User Client and Changing print job settings at the MFD. Printing is charged to an account selected by the user, and is suitable to environments with many shared accounts that are used frequently. Users can select the account to charge to by searching for it using the account's name or code, making it much easier to find an account when there are many in the list. The search can also be cached. Users can select the account to charge to from a hierarchical list (i.e. sub-accounts are indented from their parent accounts for clarity). Users can select the account to charge to from a list of most commonly used, preferred accounts. This is a useful feature when many accounts exist, but each user mostly just uses a few of them. This is not available when selecting an account at the MFD. Users can select the account to charge to from a list of recently used accounts. This is a useful feature when many accounts exist, but each user mostly just uses a few of them, almost all the time. Users can enter comments for a print job. For example, to explain the reason for the cost adjustments. Users can apply the available, pre-configured cost adjustments on a print job. For example, a 200% adjustment could be defined for manually loading photo paper (charge twice the standard cost). Other common examples of adjustments include Mylar Film, draft paper, draft printing mode, discounts for "special" customers/jobs, and extra for binding and manual handling. For more information about configuring cost adjustments that are available to users (including percentage rate adjustment, per job adjustment, per page adjustment), at a global or printer level, see Define cost adjustments. Users can toggle the inclusion of the print job cost on the invoice. For example, sometimes users may want to assign an account to a print job, but not have it included on any invoice reports. 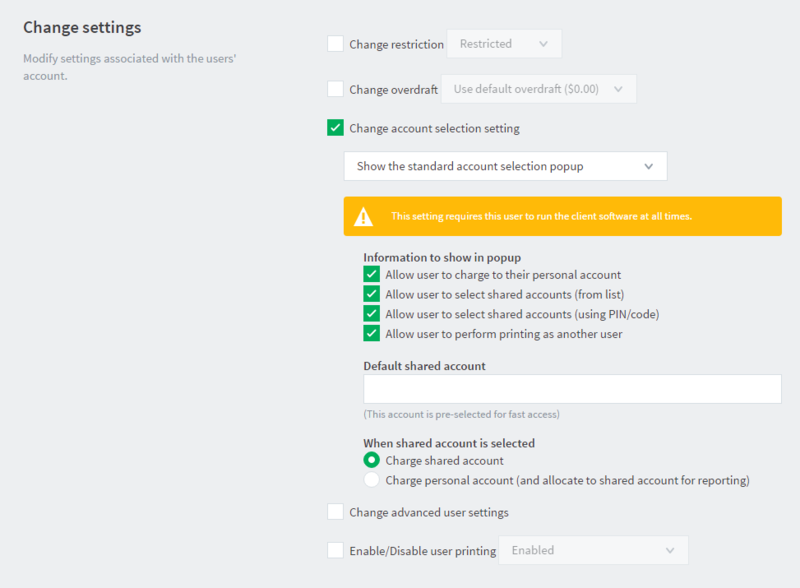 In addition to the above options that are available by default, the Charge to their personal account allows you to give the user this additional option when assigning an account to charge the print job to. When a shared account is selected by a user, the Default shared account option allows you to specify a default shared account, which is pre-selected for the user, further accelerating the process of selecting a frequently used account. the user's personal account, but in reports the job is appears as allocated to the selected shared account. In a Professional (Client Billing) installation, users who print jobs for clients are often enabled with the Advanced Account Selection option. After deploying the User Client on user workstations (if required), you can configure users with this option, either one user at a time or update for all users in bulk. Use the User Details page to enable the Advanced Account Selection option for a single user. If you do not want to allow users to charge printing to their personal account (i.e. they must select a shared account) then clear the Allow user to charge to their personal account check box. Once completed, the Advanced Account Selection option is enabled for the selected users. It is recommended that you test this from the User Client on a desktop or on the printing device (if applicable). Ensure that user interaction provided is as per the configured Advanced Account Selection option. Once the interaction is completed, ensure that the job is printed, logged and appropriate account charged. This requires the User Client. This is designed for authorized users in the role of "print managers" who perform printing on behalf of other users, providing them with several options, such as being able to charge printing to any user or account, apply adjustments to the job costs (e.g. for charge for special paper, binding, etc). This is suitable to print rooms where staff print on behalf of other users and email them to the users; these print jobs often involve complex instructions such as binding, color paper covers, etc. Users can select any user to charge to by specifying the username or ID number. The print job is logged under this user's account. Users can apply the available, pre-configured standard cost adjustments on a print job. For example, a 200% adjustment could be defined for manually loading photo paper (charge twice the standard cost). Other common examples of adjustments include Mylar Film, draft paper, draft printing mode, discounts for "special" customers/jobs, and extra for binding and manual handling.